If you’re reading this you’re part of more than 263 wonderful folks who have clicked on the link without knowing where it’d go. Thanks for trusting & helping me fine tune my “instant bitcoin payment” idea. The popularity of smartphones and mobile devices in Africa has secured means to ‘bank’ the unbanked – but how can such lessons apply to cryptocurrency? We explore. The start of the 21st century tells a tale of a world that finds its feet in connection and versatility; a story that is powered by the emergence of the internet, that finds its theme in disruption, and binds together people around the globe in both a physical and literal web of information. As access to the internet has proliferated around the globe to touch billions of users, so too has the ‘dash from cash’ occurred; a pivot which has seen enterprises won and lost in the blink of an eye thanks to the success – or failure – of their ability to adapt to new paradigms and win consumers ready to transact in a digital age. rafiq.co.za/btc was born using everything available on a web server, by default, so it only costs thoughtful application of open source software create. Receiving and Sending Bitcoin and other cryptocurrencies to a very long address is as complicated as an EFT or scanning a QR code on a mobile phone. 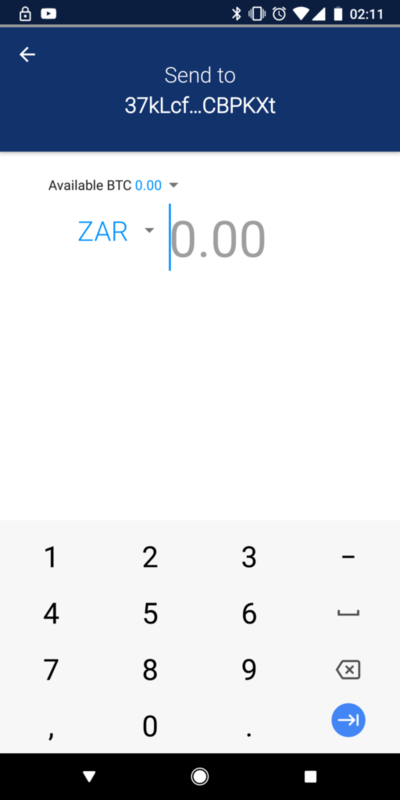 Create a URL that is easy to remember & works with any bitcoin app that is installed on the users mobile phone, rafiq.co.za/btc is opened within whatsapp, telegram, hangout, skype chat, facebook messenger, with my BTC address auto-completed and filled in. Enter amount, hit send. How to make a BTC payment easy without a QR code or remembering a long address? Would you find something like this useful? Share your thoughts with me here. 1. 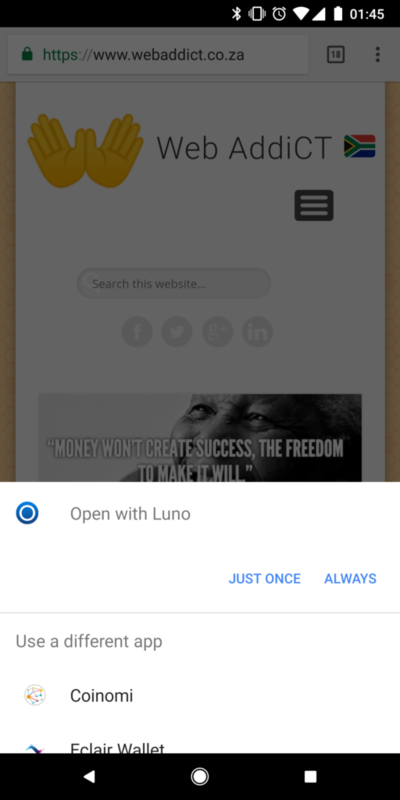 Click rafiq.co.za/btc in Telegram, WhastApp, Skype, facebook messenger, Google hangout or while browsing Opera Mini, Safari or Chrome on your Android or iOS phone. 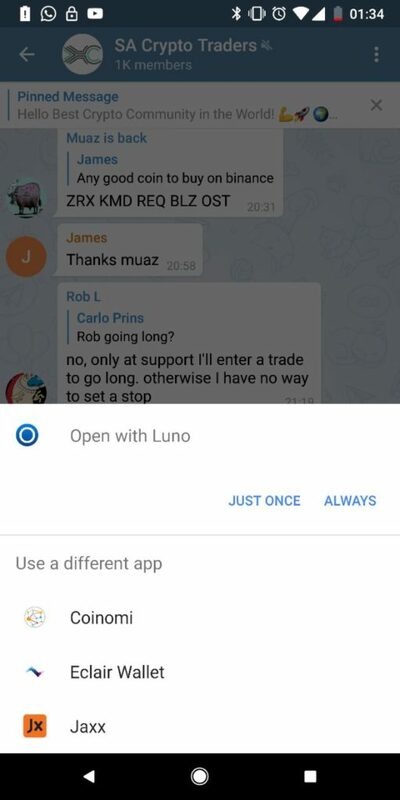 BTC Address already completed in Luno app, enter amount, hit send. 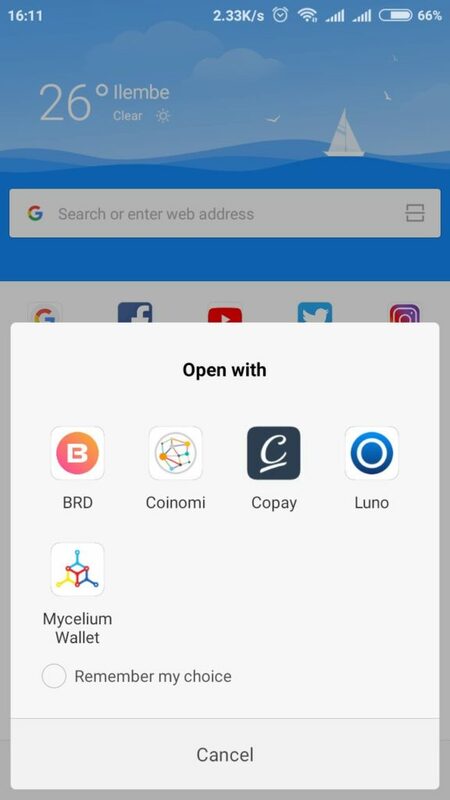 If you have multiple bitcoin mobile wallets installed you’ll be prompted to pick One. No idea what this is about? Here are are 11 Questions you’ll eventually need to answer.